Having spent 3 tours overseas while serving in the U.S. Air Force, and having travelled to numerous foreign countries on TDY’s in support of the Air Force as a military contractor; travelling to a foreign country such as the Philippines was not the cultural shock as I imagine it would be for someone who has never travelled outside the U.S., as my son for instance. Still, there were things that took some adjusting to when I settled in at my sister-in-laws house in the Province of Naga Cebu. We Americans take so much for granted that I wonder how many would be able to adjust to the lifestyle of a typical Filipina family. For instance, we expect to have reliable utilities; when we flip a switch we expect to have steady power to our outlets and our lights and when we turn on a faucet we expect water to come out. In the Philippines, or at least in the outlying provinces, these things are not taken for granted; in fact they are often luxuries that people are grateful for. Many times, often during the hottest hours of the day, the power would drop to abnormally low levels; so low they would not be sufficient to run a ceiling fan or portable fan to cool off your home; not to mention be insufficient to run an air conditioner when temperatures inside the house reaches close to 90 degrees with a 95% humidity rate. Then there were times when the water simply stopped for hours on end for no apparent reason. These are things we take for granted, and the lack of them, or their unpredictable nature are things that the average Filipino live with on a daily basis. We Americans also take our privacy for granted; having the ability to shut our doors and not have uninvited visitors simply walk into our homes. Yet during the time I spent there I daily saw people; kids particularly, just walk into my sister-in-laws house and make themselves at home. This is nothing to them; as they invite them to eat along with them when it comes time to serve meals. This level of friendliness and generosity is something that I have yet to see on American soil; particularly when the average Filipino family lives in, what we could only describe as, abject poverty. For instance, my wife’s brother Jerry works at a cement factory doing very strenuous work under the sun all day; breathing the dust of the ingredients which make up the cement they produce. Yet his salary is only 400 Pisos per day. The exchange rate between Piso’s and U.S. dollars, in case you are interested, is 46:1; making his daily earnings $8.70 per day. Yet out of that he has to feed his family and pay for the transportation required to get him back and forth to work as the average Filipino family does not own a private vehicle of their own. Much of a typical Filipino family’s time is spent planning the next meal they will eat. The average family does not own a large refrigerator like we do; if they have refrigerators at all. Therefore each meal requires a trip to the local market to purchase the required ingredients needed to prepare the food they eat. This again entails paying local transportation to and from the market on top of the cost of the food they eat. 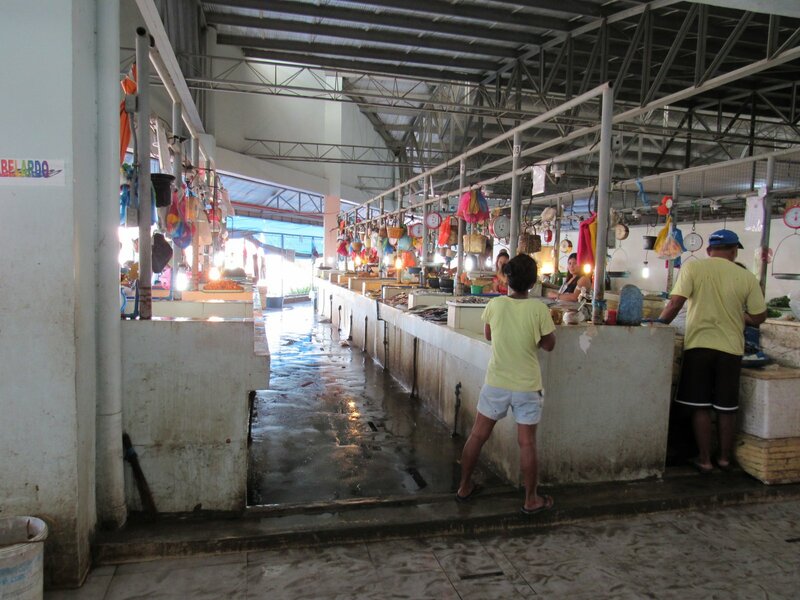 Another thing which many of my fellow countrymen might not be able to handle is the typical Filipino market. 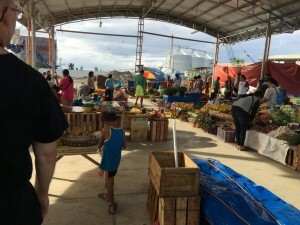 While there are larger American style supermarkets, the cost of food items there is typically higher, and also they are much more crowed and the wait at the cashier line can take up to an hour; so many visit the more common open-air markets. These would come as quite the shock to many Americans who are used to having their meat pre-packaged and their fruits and vegetables kept in refrigerated racks. Below a couple photos of typical open-air markets. If you’ll notice, the meat is kept on hooks where they take down the requested selection and cut off the amount needed for each customer. Not only is the meat not refrigerated; flies buzz around the cuts of meat hanging on the hooks constantly. It is not something the typical American family would feel comfortable feeding their family; yet it is where a vast number of Filipinos go to so they can purchase the food they eat. Much of the produce the typical Filipino family eats comes from local vegetation which grows in, and around, the province in which they live. For instance, Kamungay, or Malungay in Tagalog, is a typical tree that grows all over the countryside. In the Visayan provinces the leaves form a staple in their diet; and I became pretty adept at stripping them from the branches during my 3 weeks spent there. I had eaten them before; and eat them to this day at home; but the Kamungay we purchase is frozen and shipped from places where the climate allows it to grow. There is a world of difference in both taste and texture between the frozen Kamungay we get here in the states and the Kamungay taken directly from a tree. If I had my dithers I’d eat the fresh Kamungay; but that’s not possible because it will not grow where I live; maybe in more tropical climates like Southern Florida, but not where the winter temps dip to freezing. Believe me, we had seeds shipped to us from the Philippines and the seedlings die off in the winter months; even with greenhouses. So you see, there are many things the typical American family take for granted that are luxuries for the average Filipino family; making me question whether we Americans have not become a bit spoiled in our way of life. It has also caused me to have a great deal of respect for people who live under such harsh conditions and yet still be among the most warm and welcoming I have ever met.